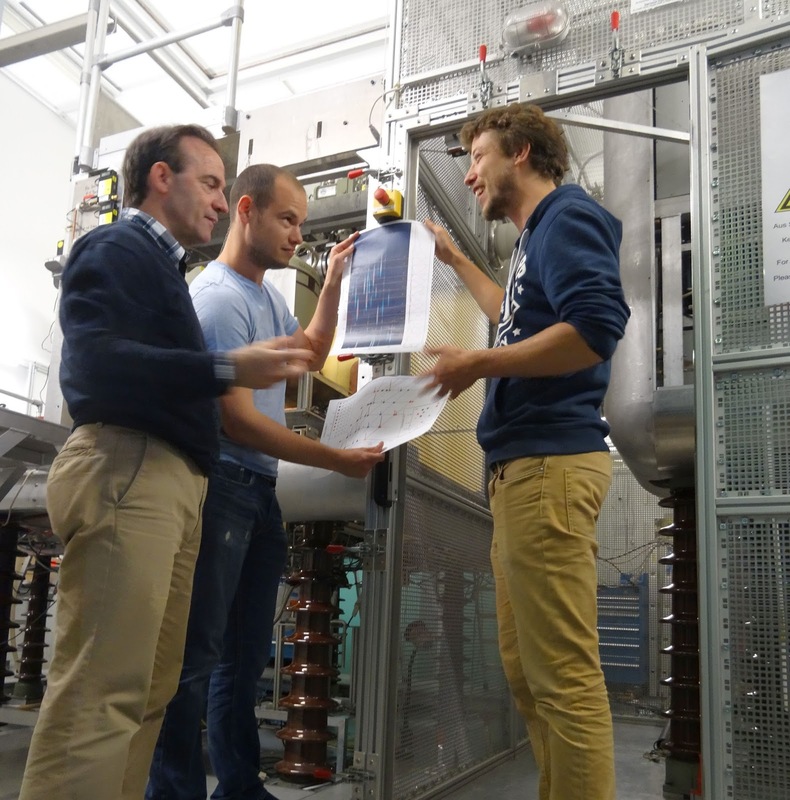 From left to right: José, Alexander and Hendrik discuss the spectral analysis -- standing next to the Heidelberg electron beam ion trap, where the results were obtained. Affiliation: Max-Planck-Institut für Kernphysik, Heidelberg, Germany. We studied the uncharted optical spectra of the highly charged ions W14+, Re15+, Os16+, Ir17+, and Pt18+, and demonstrated generally applicable methods to identify the measured spectral lines. That allowed us to infer the transition energies for proposed ultra-stable frequency standards using Hf12+ and W14+ ions. 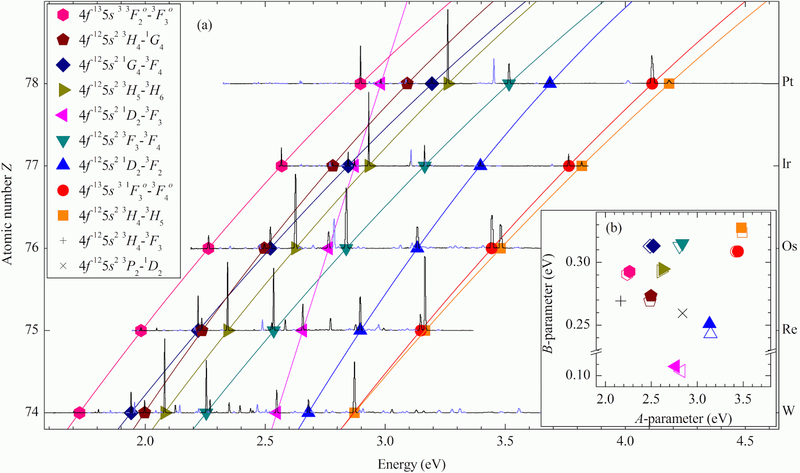 In Ir17+, optical transitions with the highest sensitivity to a potential variation of the fine structure constant α ever predicted for a stable atomic system were determined. Highly advanced atomic structure calculations were benchmarked in the extreme regime of a triple level crossing. Fundamental constants are taken as given by Nature. Our understanding of the origin of these constants is, however, rather poor: Their values are not set within the Standard Model but have to be determined empirically. Alternative theories, such as string or coupled dark energy theories, assume that fundamental constants emerge from dynamical fields and can vary at different times or places in the universe (see  for a review). Therefore, probing the stability of these constants allows us to search for physics beyond the Standard Model. Our work focusses on testing a possible variation of the fine structure constant α, which characterizes the strength of interaction between charged particles and photons. Very small variations of α would lead to a detectable shift of wavelength, or color, of light which is emitted or absorbed by atoms. Following this approach the group of Webb et al. obtained the absorption spectra of interstellar clouds billions of light years away from us and in an extensive analysis found wavelength shifts for spectra observed at different angles . This was interpreted as a spatial dipole-like variation of α. We aim to test this extraordinary claim under well-defined laboratory conditions, preventing systematic uncertainties that the astrophysical observations might suffer from. Since the Earth, the Solar System, and our galaxy all move, a spatial variation translates into an effective temporal variation which was estimated at 10-19/year . Such a minuscule drift could be measured by monitoring the frequency ratio of two highly accurate optical atomic clocks. The clock transitions should be very sensitive to an α variation, but to nothing else. Highly charged ions fulfill these requirements. With an increasing ionic charge, the wavelengths of electronic transitions decrease and leave the range accessible to lasers. Systems with level crossings are an exception. When two or more configurations are almost equal in energy, optical transitions are possible. The level crossing of the 5s and 4f subshells predicted for Ir17+ should enable the highest sensitivity to the sought-after α variation in a stable atomic system . No detailed knowledge of the electronic structure of these ion species existed. 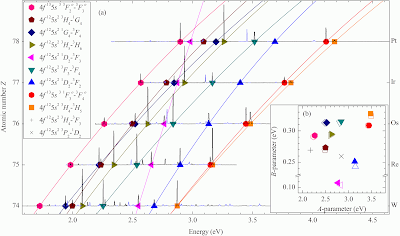 Most heavy highly charged ions, as Ir17+, are experimentally unexplored, and calculations are not sufficiently accurate for these complex systems. For our studies, we used the Heidelberg electron beam ion trap, which produces and traps the ions of interest. The continuously excited ions decay by emitting radiation, of which we analyzed the optical spectrum. An exemplary measurement can be seen in Fig. 1, showing the optical spectra of W14+, Re15+, Os16+, Ir17+, and Pt18+ (atomic numbers Z=74-78). These ions encompass the whole predicted 5s-4f level crossing region. Figure 1. (Click on the figure to view with higher resolution) Typical spectral map of Ir ions measured using the Heidelberg electron beam ion trap. For this measurement we acquired spectra at 10 V intervals of the electron beam acceleration potential. New groups of fluorescence lines start to appear when the electron beam energy reaches the ionization potential of an ionic charge state. The new charge state is produced more efficiently as the electron beam energy further increases, and the fluorescence lines become stronger until the ionization threshold of the next higher charge state is reached. At this point the ion population is transferred to the next charge state, which starts to fluoresce, while the former one disappears. This dependence of the fluorescence intensity on the acceleration potential is depicted in the right graph. It is notable that this section of the optical spectrum assigned to Ir17+ already shows a dense manifold of spectral lines. In order to derive the level structure from the spectrum, sophisticated identification schemes had to be applied. Subsequently, we assigned the measured spectral lines to their corresponding electronic transitions to establish the level scheme . Given the large theoretical uncertainties, a direct comparison of calculated and measured spectra is futile. Instead, we used three alternative methods to identify the spectral lines. First, we exploited the fact that these ions are isoelectronic, since they have the same number of electrons, and thus similar atomic structures. Over a limited range of atomic numbers, the transition energies depend on the respective nuclear charge with a simple polynomial scaling. By comparison between the measured scaling functions and theoretical predictions we were able to reliably identify all underlying transitions as can be seen in Fig. 2. Figure 2. (Click on the figure to view with higher resolution) Identification of isoelectronic transitions using their characteristic energy scaling. (a) Measured spectra of W14+, Re15+, Os16+, Ir17+, and Pt18+ (black lines). An algorithm found nine isoelectronic transition energies that obey simple quadratic scaling laws (colored lines) as expected from theoretical considerations. (b) By comparing the experimentally determined constant offset A and the linear term B (full symbols) to the calculated ones (open symbols) an unambiguous identification of the underlying transitions could be achieved. This method could be independently confirmed by measuring the identified transitions in Ir17+ with increased resolution and accuracy. 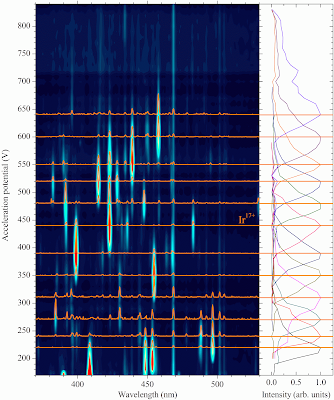 The spectral lines revealed a characteristic line shape caused by the 8 T magnetic field present at the position of the trapped ions. The observed line shapes were individually modelled according to the Zeeman effect, leading to an independent verification in perfect agreement with the scaling method. The identified transitions allowed us to test advanced atomic structure calculations for the first time in systems with such a complex level crossing of 4f 12 5s2, 4f13 5s, and 4f 14 configurations. We found that only relativistic multi-reference Fock-space coupled cluster calculations consistently showed a fair agreement with most of the observed lines. A direct application is the determination of the transition energies of two proposed optical clock transitions with a potential relative frequency uncertainty of less than 10-19 in W14+ and Hf12+ , another isoelectronic ion. Although we did not measure the spectrum of Hf12+, we were able to extrapolate the transition energy by applying the established energy scaling. Our experimental uncertainty is at least one order of magnitude smaller than that of predictions. These clock transitions are exceptionally stable. However, they are not sensitive to a variation of the fine structure constant. For that, Ir17+ is ideal. By searching our data, we found closed transition cycles (Rydberg-Ritz principle) combining the identified with unidentified transitions. This enabled us to find two possible, but mutually excluding, candidates for the proposed α-sensitive transitions. We are currently performing more accurate measurements to remove this ambiguity. Our method, line assignments by isoelectronic scaling of transitions (LINE ASSIST) is a straight-forward and general tool for exploring unknown spectra of highly charged ions. With the recent successful application of sympathetic cooling to highly charged ions , much higher accuracy can be achieved in future work: the ion temperature was reduced by nearly six orders of magnitude and the Doppler width accordingly. The experimental values for the transition energies obtained in the present work are needed for follow-up laser spectroscopy studies, applications as optical clock transitions, and testing the constancy of fundamental constants. Jean-Philippe Uzan, "The fundamental constants and their variation: observational and theoretical status". Review of Modern Physics, 75, 403–455 (2003). Abstract. J. K. Webb, J. A. King, M. T. Murphy, V. V. Flambaum, R. F. Carswell, M. B. Bainbridge, "Indications of a Spatial Variation of the Fine Structure Constant". Physical Review Letters, 107, 191101 (2011). Abstract. J.C. Berengut, V.V. Flambaum, "Manifestations of a spatial variation of fundamental constants in atomic and nuclear clocks, Oklo, meteorites, and cosmological phenomena". Europhysics Letters, 97, 20006 (2012). Abstract. J.C. Berengut, V.A. Dzuba, V.V. Flambaum, A. Ong, "Electron-Hole Transitions in Multiply Charged Ions for Precision Laser Spectroscopy and Searching for Variations in α". Physical Review Letters, 106, 210802 (2011). Abstract. A. Windberger, J.R. Crespo López-Urrutia, H. Bekker, N.S. Oreshkina, J.C. Berengut, V. Bock, A. Borschevsky, V.A. Dzuba, E. Eliav, Z. Harman, U. Kaldor, S. Kaul, U.I. Safronova, V.V. Flambaum, C.H. Keitel, P.O. Schmidt, J. Ullrich, O.O. Versolato, "Identification of the Predicted 5s−4f Level Crossing Optical Lines with Applications to Metrology and Searches for the Variation of Fundamental Constants". Physical Review Letters, 114, 150801 (2015). Abstract. V. A. Dzuba, A. Derevianko, V.V. Flambaum, "High-precision atomic clocks with highly charged ions: Nuclear-spin-zero f 12-shell ions". Physical Review A, 86, 054501 (2012). Abstract. L. Schmöger, O.O. Versolato, M. Schwarz, M. Kohnen, A. Windberger, B. Piest, S. Feuchtenbeiner, J. Pedregosa-Gutierrez, T. Leopold, P. Micke, A.K. Hansen, T.M. Baumann, M. Drewsen, J. Ullrich, P.O. Schmidt, J.R. Crespo López-Urrutia, "Coulomb crystallization of highly charged ions". Science, 347, 1233 (2015). Abstract.